Left: USPS Consumer Advocate John Budzynski. 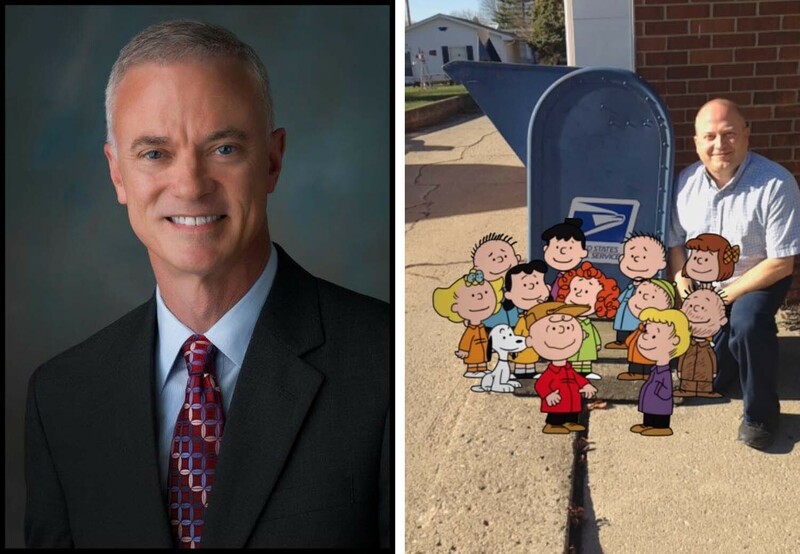 Right: Sycamore, OH, Postmaster Earl Musick poses with the Peanuts Gang (thanks to the USPS Augmented Reality App, available for Android and iPhones). The holidays are here, and so is another eidtion of Your Postal Podcast, filled with tips for customers mailing gifts and greetings, along with special remembrances of A Charlie Brown Christmas." In this edition you'll hear from USPS Consumer Advocate John Budzynski on how the Postal Service is helping customers make shopping and shipping a whole lot easier this holiday season. Next you'll meet the Postmaster of Sycamore, OH, who has a very personal connection with the new "A Charlie Brown Christmas" Forever Stamps. You can also access Your Postal Podcast via your mobile device at YourPostalPodcast.com/mobile. Thanks for listening and Happy Holidays!